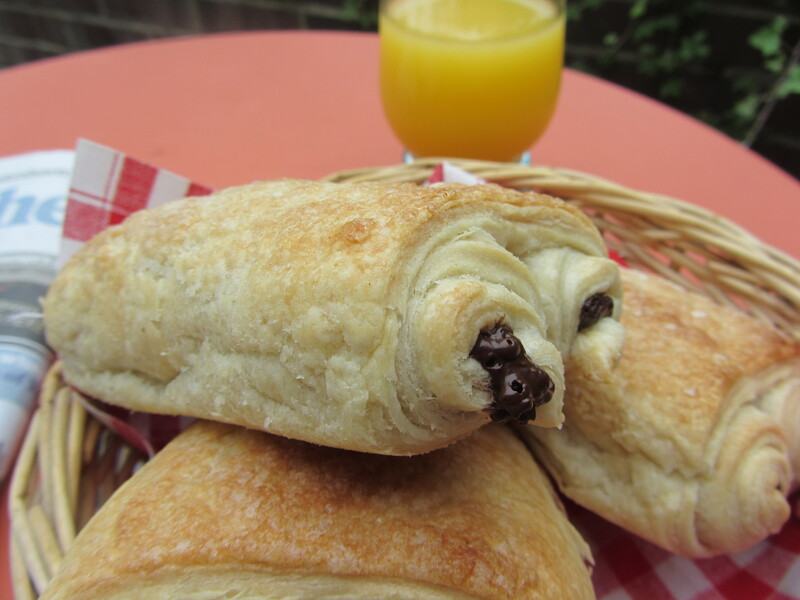 Whilst we were on holiday in France, every morning Big S would see us enjoying freshly made pain au chocolat and asked if I could make some dairy-free ones when we got home. I have previously written a post about dairy-free croissants and pain au chocolat and to be honest they are quite an ordeal to make at home, unless you have lots of free time on your hands. Since it was the last day of the summer holidays and we wanted to have some fun too, I decided to knock up a cheat’s versions using ready-made puff pastry. I don’t claim that they are at all authentic, you miss the yeasty/doughy flavour and obviously being buttery is part of the essential nature of a pain au chocolat, but you do get a similar effect – flaky pastry with an oozy, gooey dark chocolate centre. 60g dark dairy-free chocolate, cut into strips. – Grease a baking sheet and set aside. – Unroll the pastry and roll out to an even rectangle, as big as possible. Cut into even strips 5-10 cm wide. – On the short sides of the strips, place a strip of chocolate at each end. Roll up each side around the chocolate and keep rolling until the cylinders meet at the centre. – Turn over and place on the greased baking sheet. 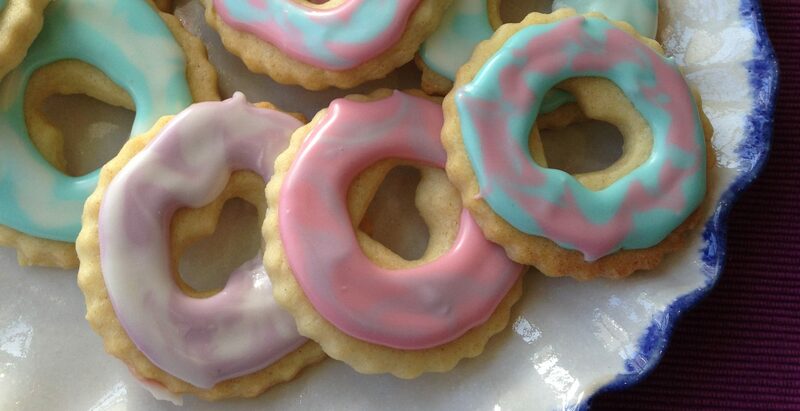 – Brush the top of each pastry with the melted dairy-free spread and sprinkle with icing sugar. – Bake for 20-25 minutes, until golden brown and cooked through. So simple and yet so creative. I have to try these. They look great! 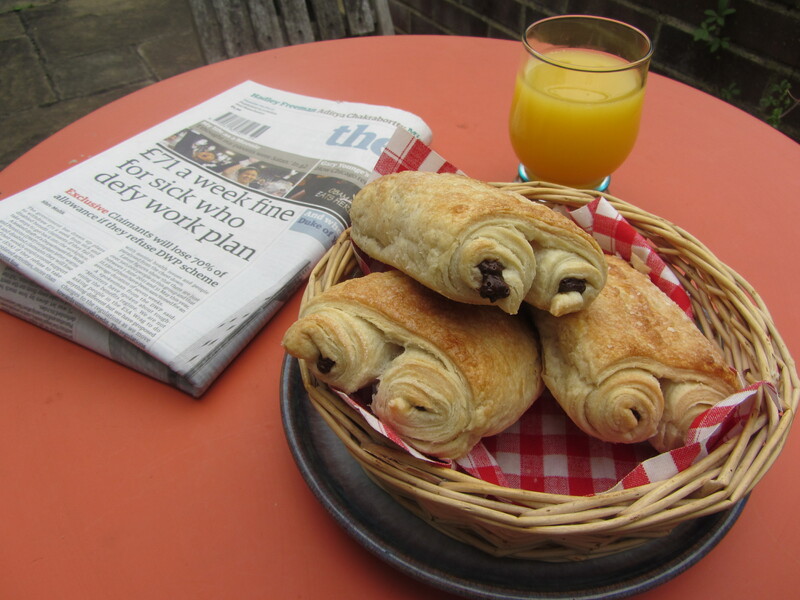 Thank you… not quite a real pain au chocolat, but they’re hard to come by if you’re egg and dairy-free! Oh yum! And so easy too when you don’t have to make the pastry yourself. I love that most puff pastry (and filo pastry) is vegan. I made these beauties yesterday morning & they came out perfect! I was so happy because I am lactose-intolerant! I used DFree puff pastry!